disclaimer: I was sent the Incaberries to try. I am not someone who seeks out so-called ‘superfoods’. I am a great believer in all things in moderation (except bananas, which are truly awful and I would say that they should be banished from the planet, except my toddler loves them). So many food trends pass me by … yes, I’ve heard all about goji berries, acai (I still don’t know how to pronounce that) and quinoa (OK – I do actually want to try that one) but I’m not rushing out to try the latest and greatest antioxidant packed goodie that comes along. However, I am very much into trying new things so when the internet offered me Incaberries*, who was I to say no? 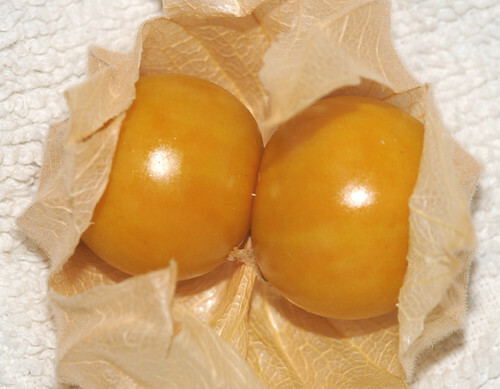 The Incaberries (actually a type of physalis) come from Ecuador and are organic, high in fibre and antioxidants. They are billed as “a great tasting superfood that you will actually enjoy eating”. Andy and I have had quite a lot of discussion about what they actually taste like. Texture wise, they are a dried fruit so they are very similar to a raisin (not quite as juicy as a sultana). The flavour is citrussy and sherberty. Somewhere between a tart raspberry, mixed with some rhubarb, some tangelo and a hint of sour lollies. If you’re not into tart flavours, it won’t be your thing at all. However, I personally loved them and even Mr Toddler has come around and likes them! When it came to cooking with them I was originally thinking of making the chocolate brownie recipe that’s on the Incaberry website. However, after tasting them and thinking about both their texture and flavour, I decided that flapjacks would be the way to go. 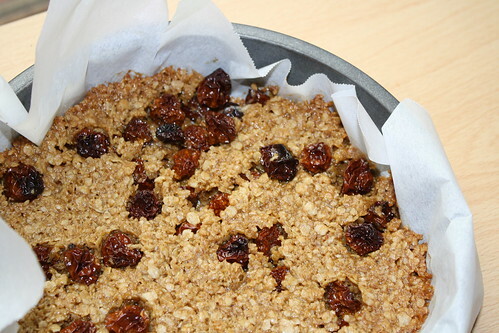 Now, lots of people seem to think that because flapjacks contain oats they are healthy. This is not true. Yes, oats are another superfood but flapjacks are really just butter, sugar and golden syrup and the oats are there as a vehicle for that. But if you want to pretend they’re a health food – just add incaberries and they’re even healthier! Flapjacks are a brilliant thing to make with small children. They have few ingredients and it’s a very quick return on your effort. In our household we always seem to have everything we need in the cupboard, too! Begin by melting 60g unsalted butter with 60g of sugar (I used light brown, but would have used dark brown had I known where it was hiding!) and 2 tbsp of golden syrup. With the golden syrup, lightly coat your spoon (both sides) in a neutral oil before dipping it into the jar: this will ensure the syrup slides off into the pan. For 2 tbsp you only need to do this the once. When the butter is melted and the sugar has dissolved, pour this mix into 100g of oats and mix well. The mixture will be quite crumbly – almost like you’re making the base for a cheesecake. Finishing by mixing through 40g of incaberries. Grease a 20cm diameter round baking pan and press the mixture into it (it will be just under 1cm thick). Ensure the incaberries are spread through evenly and bake at 180°C (convention) for about 15 minutes. I was a bit alarmed by the incaberries all puffing up during cooking but they collapse back down as the flapjacks cooled. The tartness of the berries worked really well to counterpoint the sweetness of the flapjacks. After all the sugar you get a lip smacking finish. * You can find out where to buy incaberries near you using the store locator.